So matzah matter with you? Passover Day 4 – do all the carpets in my house have dandruff? 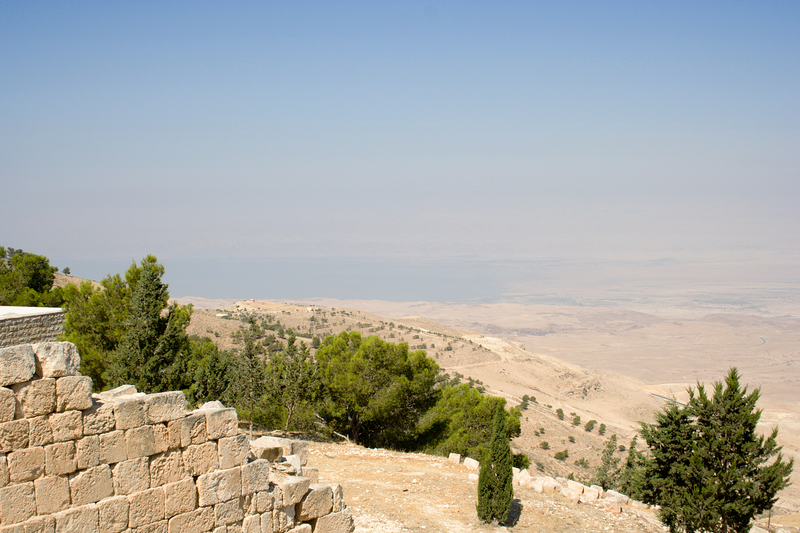 Passover Day 8 – I think Passover is over in Israel already, can I have a turkey sandwich now? We took advantage of our empty nest status to take a week-long trip to Spain this month, the first time in almost 20 years that we could travel at a time when schools weren’t on vacation. 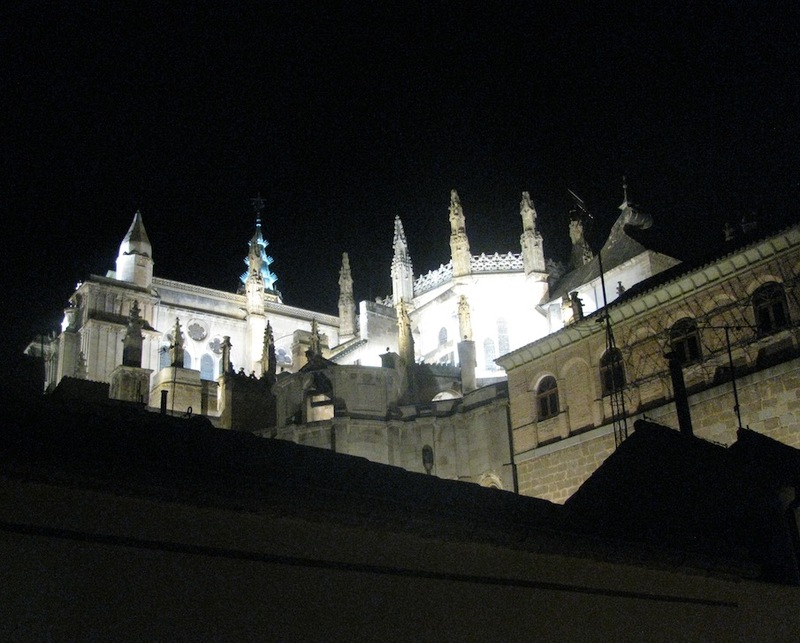 In Toledo, we have been staying in a delightful small hotel called La Posada de Manolo that, for me, is as evocative and fascinating as any of the official sights in this historic medieval city. The Sanchez Nunez family turned their 500-year-old home into a hotel that celebrates Toledo’s three religious heritages — Moorish (Muslim), Jewish and Christian. In a detailed and incredibly thoughtful renovation in 2001, each of the three floors was decorated to honor one of those traditions. 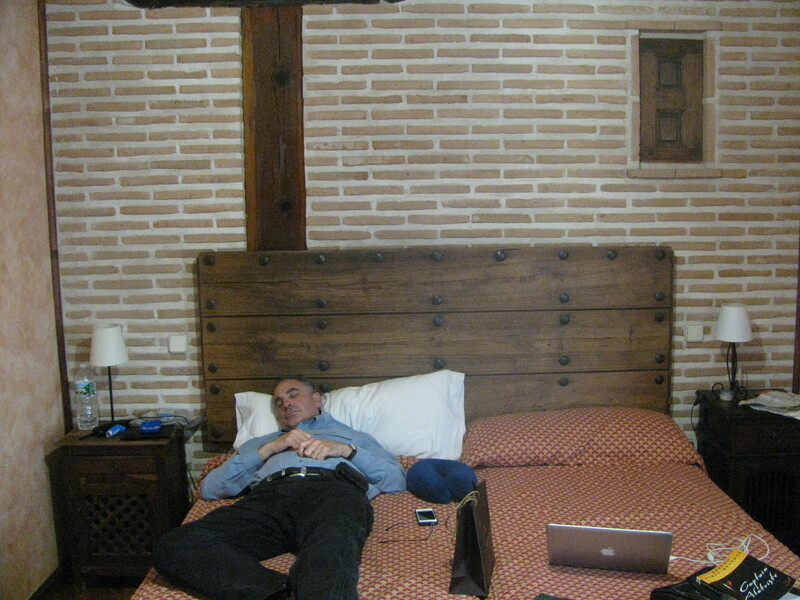 La Posada de Manolo is outfitted in my favorite style of European hotel — revealing and emphasizing the historic, artisanal “bones” of the building while providing modern comforts like wifi and a good mattress. The hallways show the heavy wooden ceiling beams; the rooms have thick, ornate wooden doors that close with iron latches. The head board and night tables in our room are heavy, rustic wood. 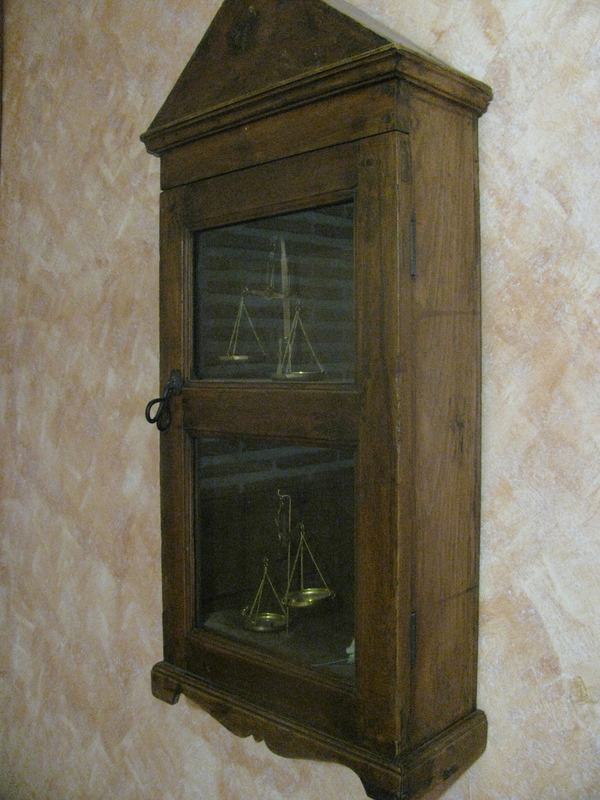 And the decor is geared to the room’s vocational theme — a wooden case on one wall holds brass scales that might have been used by money lenders, while another wall displays two medieval drawings of financial transactions. The Farmers room down the hall had a big rustic pitchfork mounted on its wall. 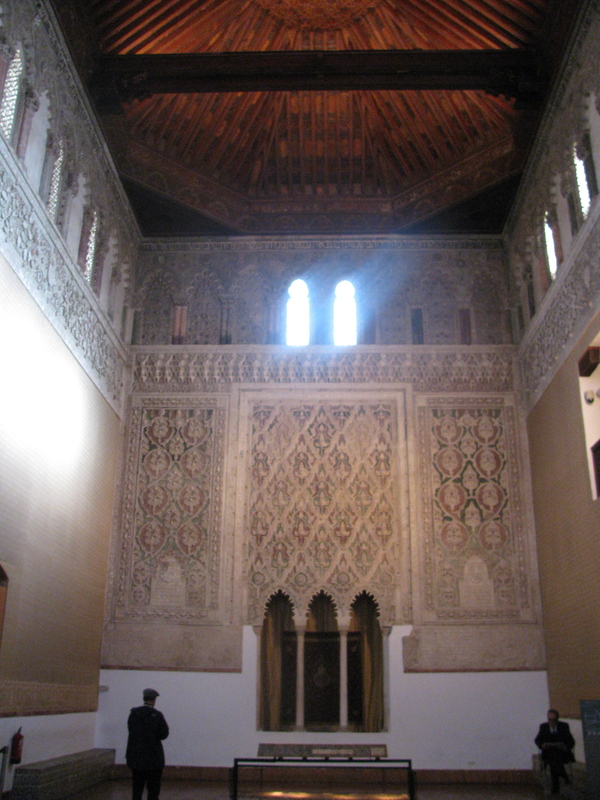 A Moorish room named after Silversmiths had, of course, some silver cups and bowls on the wall. It’s like sleeping in a museum! Like the owners of La Posada de Manolo, the city of Toledo has made a concerted effort to recognize and celebrate its three heritages. Jews lived here for about 1,000 years until they were expelled in 1492; Muslims lived here for hundreds of years until they too were forced out with the Inquisition. 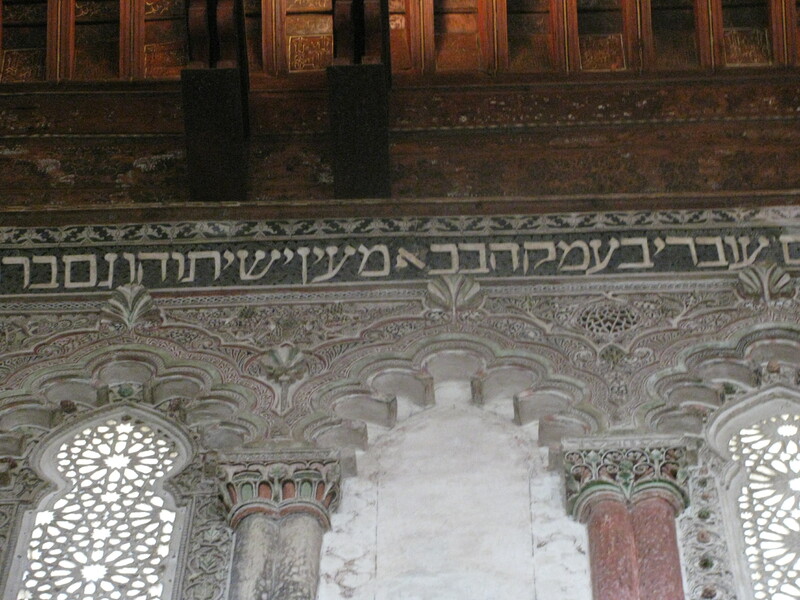 The government has renovated two synagogues, turning the stunning Sinagoga del Transito (built in the 1300s by Jews, with permission from the Christian rulers, and using Moorish craftsmen and design motifs) into a museum of Jewish life in Spain. 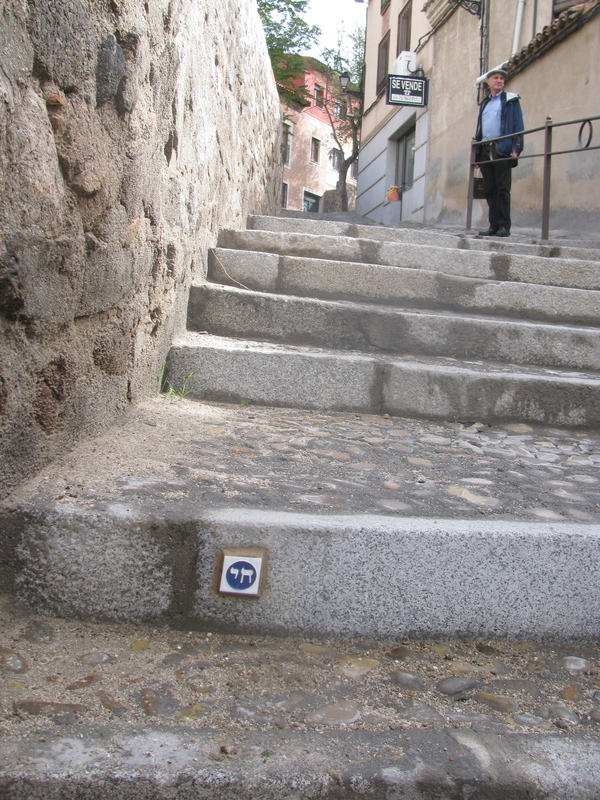 The onetime Juderia or Jewish Quarter has tiny tiles embedded in the stone streets that say in Hebrew “Sepharad” (Spanish Jewry) and “Chai” (lives). Our timing wasn’t right to catch it, but the city sponsored seven encuentros with Jewish culture in 2012 — mini-festivals of food, music and film timed to holidays such as Sukkot and Chanukah. Of course one can quibble cynically with this. It’s easy to ask: Are North African immigrants or Roma minorities the modern substitute for Jews in European bigotry? Is anti-Zionist rhetoric the 21st century version of anti-Semitism? But consider countries like Iran and Iraq that expelled or persecuted Jews more recently than Europe. Wouldn’t it be great to have them acknowledge the historic contributions of their Jewish populations the way that Western Europe has? Wouldn’t it be great to see Sepharad Chai (or the Persian translation of that) in the sidewalks of Teheran? So this is all really good. I love the renovated synagogues, the restored Jewish cemeteries, our little Jewish floor at La Posada de Manolo. But it’s also unsettling. Visiting Europe, you’re confronted not just with 1,500 years worth of great art and architecture, but with 1,500 years of nearly-constant war. Spain fighting England, England fighting France, France fighting Spain, etc. The post-World War II Europe of cooperation, economic integration, social democracy and human rights is a brilliant development but a very recent, very young development. Meanwhile, we Jews have lived in the United States in significant numbers for only about 130 years — and we feel completely secure. Assimilated. Americanized. We worry about Israel, but about ourselves? Not really. We are U.S. senators, university professors, hedge fund managers, newspaper pundits, community organizers, Hollywood producers. We are the model of a successful minority. And so were the Jews of Spain! They lived here for a thousand years! 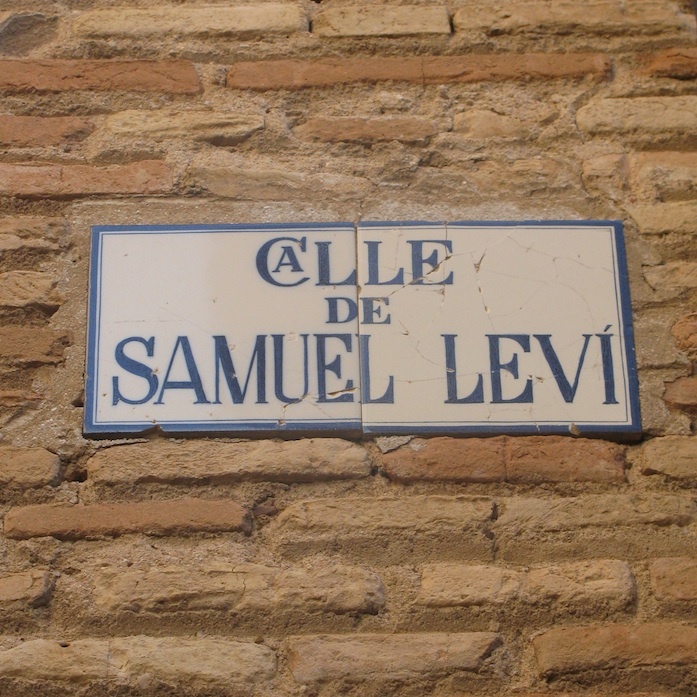 Samuel Levi, who built the Sinagoga del Transito and for whom a street is named in the Jewish Quarter, was treasurer to the king of Spain! And then…. expulsion and Inquisition. Far, far across the factories and the grass. Surely there, surely, they will let you pass. Speak then and ask the forest and the loam. What do you hear? What does the land command? The earth is taken; this is not your home. 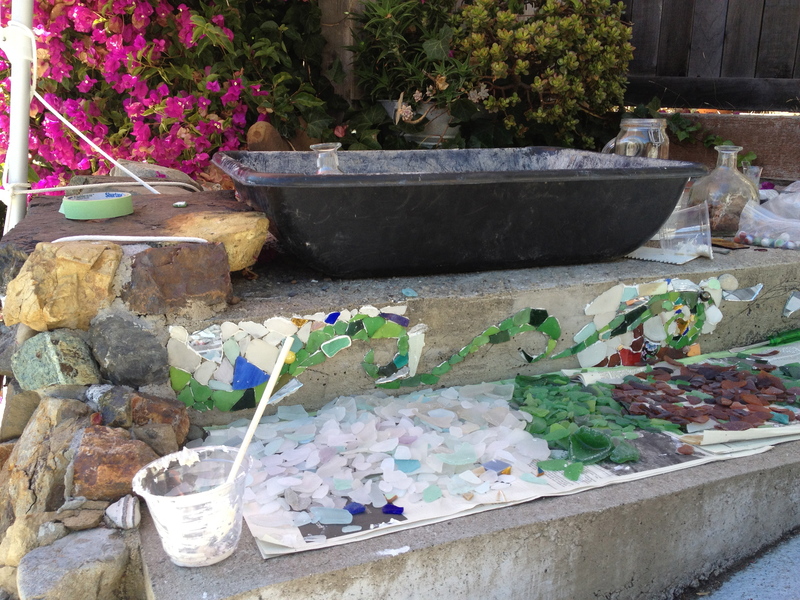 Here is a picture of the project underway, and one of what we ended up with. 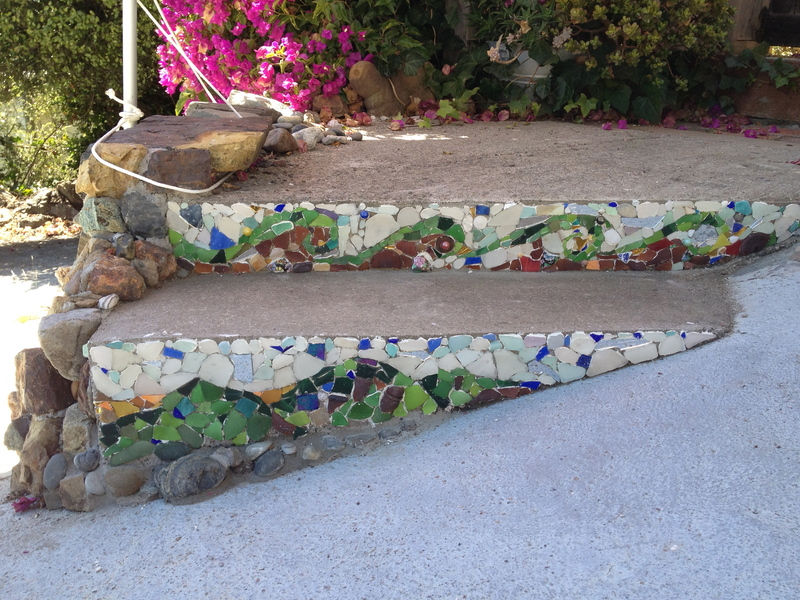 It still needs to be grouted. 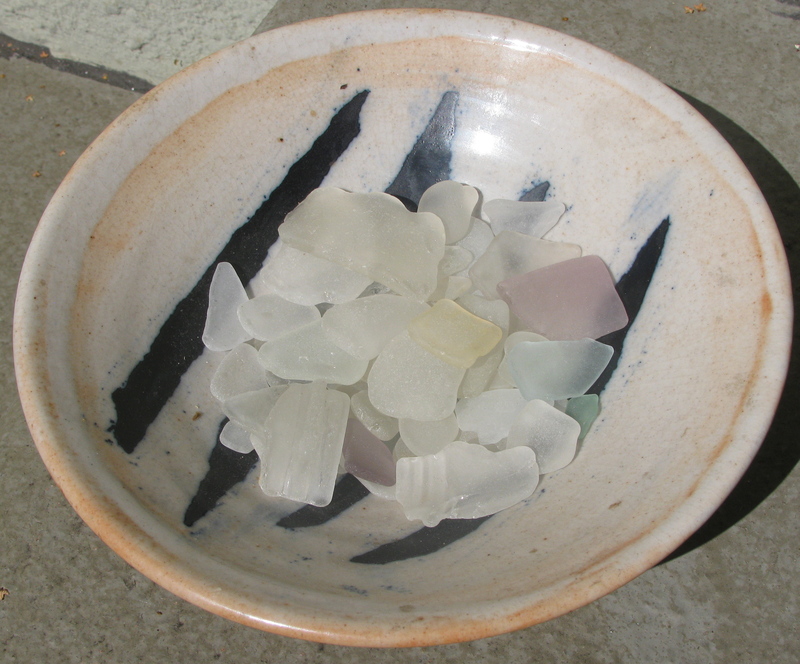 Even sitting in piles on the stoop, the sea glass pieces were beautiful. Washed and rubbed and ground by the waves for decades until smooth enough for a child to hold, they start out as trash but look like exotic gems by the time you find them on the beach. Some of my favorites are the ones that are barely larger than dots — tiny green or blue or cloudy pearls. Then last night, I woke up in the dark thinking of those pearly glass dots in tandem with some comments that our rabbi has been posting on Facebook. It wasn’t any conscious connection; those two things just slid together in my sleepy mind. As part of Elul, the month leading up to the high holy days, Rabbi Andrew Straus has been posting a short question or story each day, designed to spark reflection. If I could live this past year over again: what would I do the same? What would I do differently? For the things you would do the same – what lesson can you learn? For the things you would do differently – is there a pattern? What can you learn from that? What can you do at this point to change the things that you want to change? Jacob smiled and responded; “I will forever cherish how you saved my life, risking your own to do so, but as for the insults and hurtful words, these I hope will fade as quickly as the words I have scratched in the dirt.” With that, Jacob rose and wiped the inscription away with his foot. How many of us are carrying minor hurts with us that can be wiped away? How many of us are holding on to words said in anger and forgetting the words said in love? How many of us are remembering the hurt and forgetting the mitzvot the good deeds done for us? What would it take to wipe the words away? Who are you at your core? What is precious and sacred in your soul? What makes you, you? How do you get in touch with your innermost core? What can you do to let your core shine brighter? Rosh Hashanah begins at sundown this coming Sunday. Shanah tovah! May your coming year be as sweet as apples and honey, and as shiny as sea glass pieces, smoothed and polished into gems from our unwanted, discarded trash. Let’s start with an apology: My posts here have been getting fewer and further-between! Between the new job and the old freelance clients, I have found little time to focus on blogging in the past month. I will keep going, but perhaps not quite as often as before. Meanwhile, as a gesture of atonement, I’d like to share a wonderful column from the latest J Weekly by Editor Sue Fishkoff. I’m on the J board, and was delighted to have helped hire Sue last fall. 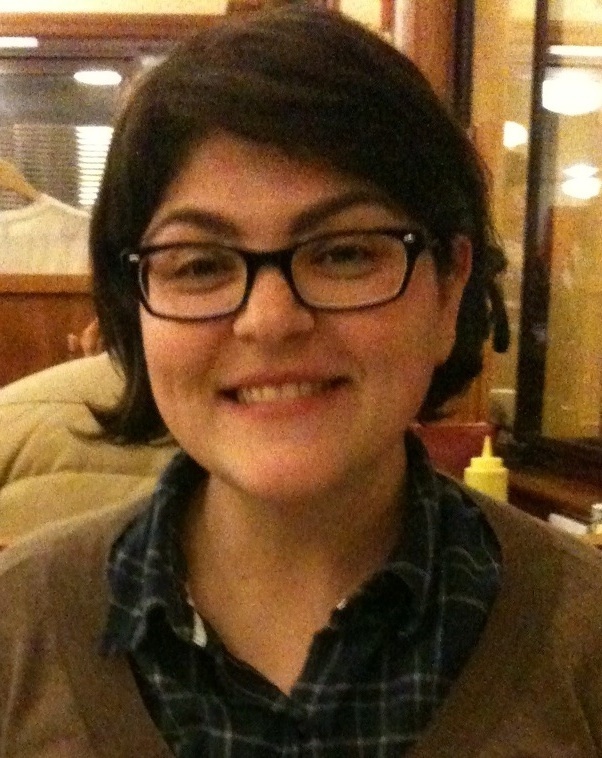 She is smart, energetic, deeply knowledgeable about the Jewish community and (as you will see) a super writer. I just wish we could clone her so she could both edit and write full-time for the paper. FYI: If you’d like to see more of Sue’s work as editor and writer, J offers a free four-week trial print subscription by mail for California residents. Or if you’re far from the Bay Area, there is an excellent weekly e-newsletter that links to all the main stories. I’ve always been fascinated by rituals. Maybe it’s because I’ve been through so few — no bat mitzvah, no prom (not cool, it was the ’70s), no graduation (’70s again), no wedding. Nothing sacred to mark the passage from one state of being, one phase of life, to another. Well, that’s not entirely true. There was my conversion ceremony, that magical day when I dunked in the mikvah and joined the tribe. At least, it should have been magical. Instead, it was odd, somewhat sad, but also kind of funny. It was the summer of 1977, and I’d spent months studying the laws of kashrut and marking up my copy of Rabbi Hayim Halevy Donin’s classic, “To Be a Jew.” I was 19, had spent a year on kibbutz, finished two Hebrew ulpans, milked hundreds of cows, and knew I wanted to formalize the connection I’d always felt to my father’s people. The monumental day arrived, an August scorcher like you don’t know from in the Bay Area. I showed up at the run-down Orthodox mikvah in Perth Amboy, N.J. and stood in a darkened room while three long-bearded rabbis from Brooklyn quizzed me about traif, asked me why God gave the Torah to Moses and not to Noah or Abraham (a trick question, you have to know the answer going in), and tested my Hebrew. An antiquated air-conditioner sputtered noisily in the corner. One of the rabbis barely spoke English. I would have giggled if I weren’t so petrified. I passed — everyone does, apparently — and was shunted off to the changing room where I disrobed, cleaned myself and stepped into the fetid enclosure that passed for a ritual bath. An elderly woman squinted at me and told me to get in the water, quick, quick, the rabbis were coming. The rabbis were coming? Wait a sec, I’m naked here! I scrambled down the steps and hunched over in the water, folding my arms over my breasts as the mikvah lady growled at me to take my hands away and let the water touch every part of my body. Oh boy, oh boy. Suddenly she threw a wet washcloth on my head, the rabbis stepped behind a screen to my right, one of them mumbled a prayer, and the mikvah lady hissed at me to dunk. Down I went, and up I came. More mumbling, more hissing, down again and up again. Then once more — mumble, hiss, down, up. And I was a Jew. No muss, no fuss, dry yourself off and out the door. In the parking lot, the sunlight nearly blinded me — was it God’s blessing pouring down upon my head? Or just summer in New Jersey? Again, no Champagne toast, no lifting of chairs, no kicking up of heels in a wild hora. Just me and Aunt Joan grabbing a tuna fish sandwich at the local diner. Deprived of what should have been a glorious occasion, I decided that my next Jewish step would be marked with the proper solemnity. I was going to have an adult bat mitzvah. And I was going to don a tallit. Here’s the thing with me and the tallit: I’m all about egalitarianism in shul. I feel uncomfortable behind a mechitzah. I like a woman’s voice leading services. I like being called up to the Torah. But I always declined the prayer shawl. I felt I hadn’t earned the right to wear it. I was going to wait for my bat mitzvah and do it right. I was going to bask in the ritual. Then last fall I was invited to be the scholar-in-residence at a Conservative synagogue in Florida. During Shabbat services, I was called up to the Torah, and there was the gabbai smiling and holding out a tallit for me. I paused, then blurted out, “I’ve never worn a tallit before.” The gabbai hesitated. The congregation fell silent. I took a deep breath, thought about my carefully laid plans and brushed them aside. How could I offend my hosts? Why was I being so arrogant? I took the shawl, said the prayer, kissed the fringes, and draped it carefully over my shoulders. Sometimes sacred moments just happen. I’m a writer and I swim in words. But occasionally, there is an image that expresses things better than any words I could write. When I was in Israel back in November, I took several photographs of the stones of the Western Wall because I loved all the textures and colors. It’s a classic image; I thought it might be useful sometime for this blog. When I squinted my eyes, those images blurred and became the same — both patchworks of textured white stone. 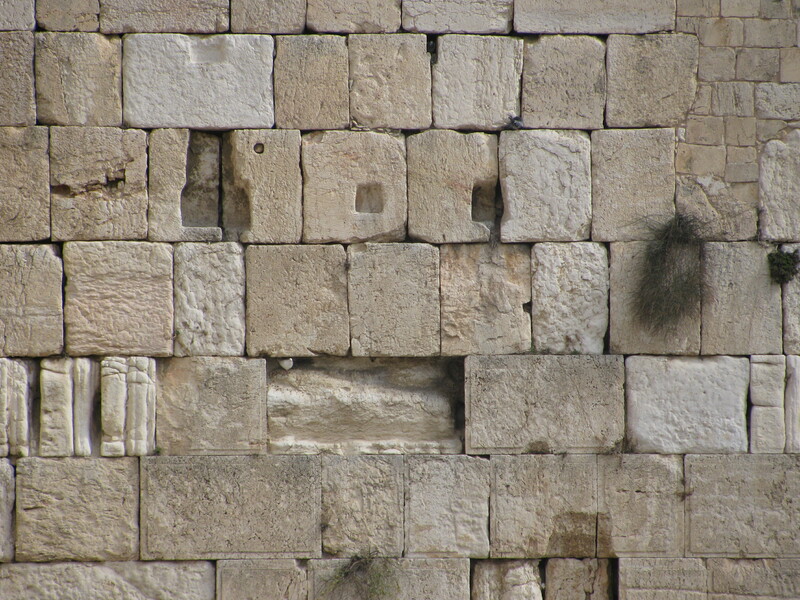 One was the Wall, the most sacred site in Judaism. The other was a workaday Palestinian neighborhood. The Torah portion for my Bat Mitzvah service almost a year ago concerned construction of the Tabernacle, and I talked about how places — official “sacred” places, places in wild nature, other kinds of places and settings — can help us get in touch with the spiritual part of ourselves. But physical places can also become idols, false gods. I understand how, for many people, the Western Wall is a sacred place. But what those photos say to me is that living communities — the people in them, no matter the nationality or religion — are equally sacred. To me, the people of Israel and Palestine will always be worth more than any particular place. No stone wall is worth a human life, no matter how many thousands of years of Jewish history it embodies. No olive tree is worth a human life, no matter how many generations of Palestinian family tradition it represents. That’s the basis of the land-for-peace concept, the basis of a two-state solution. Both Israelis and Palestinians must give up some places that are precious to them in order to save lives that are ultimately more precious. With right-wingers like Netanyahu and Lieberman running the Israeli government, and the rejectionists of Hamas tying the hands of Palestinian moderates, that solution seems almost impossibly distant these days. But governments can change — maybe Israel’s will. 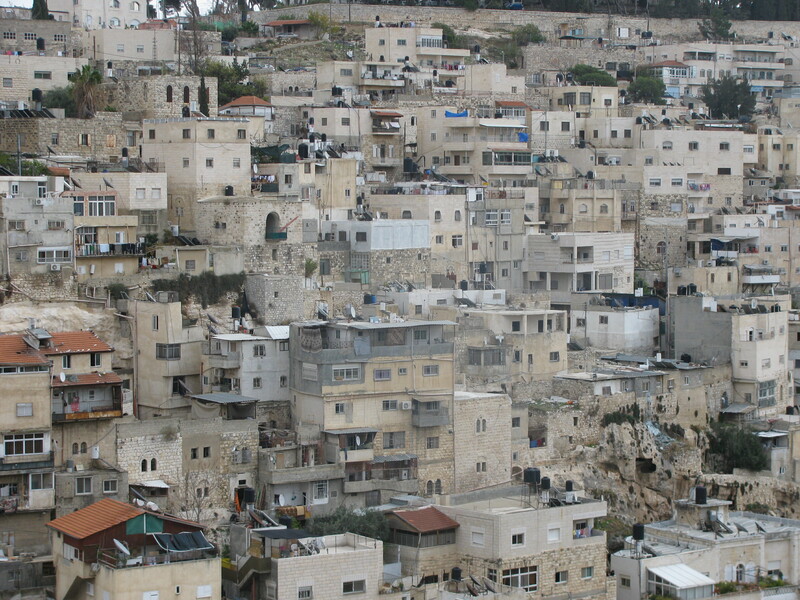 And perhaps a more open Israeli government will spark a parallel openness among Palestinians. What we can do, in the meantime, is keep reminding ourselves and our leaders that human lives are more sacred than any walls, trees or stones. That’s why I support groups like J Street and Americans for Peace Now. There! It just took me 379 words to deliver this preachy message. When really, all it takes is looking at those two images. I don’t usually talk about politics on the pulpit. In general, it strikes me as arrogant to claim to know “the Jewish position” on any policy choice our society faces. The rabbis of the Talmud could not agree with each other on the issues of their own day, so how can we imagine that we know what positions they would take on immigration reform, tax policy or gun control? Yet, even if Judaism cannot dictate specific policies, Judaism can teach us values that will guide us as we struggle to find the best way to shape our society. This week’s Torah portion (Vayera), I believe, has something important to say to us about the values we apply when weighing the needs of the individual against the needs of society as a whole. There are lessons for us in the Torah about the way we think about wealth and its obligations. After a while, travelers avoided these cities, but if some poor devil was betrayed occasionally into entering them, they would give him gold and silver, but never any food, so that he was bound to die of starvation. Once he was dead, the residents of the city came and took back the marked gold and silver which they had given him, and they would quarrel about the distribution of his clothes, for they would bury him naked. (Ginsburg, Legends of the Jews, 1:247). It should be painfully obvious how to apply this teaching to our own society. We, in the contemporary developed nations, are living in the most affluent society the world has ever known. The comfortable among us toss around miraculous electronic gadgets as if they were toys (I’m typing on one right now), and we are so used to the luxuries of modern life that we have come to think of them as necessities. Yet, we live oblivious to the poverty next door to us. In the relatively affluent Florida county where I live, almost 15% of the population is at or below the poverty line. 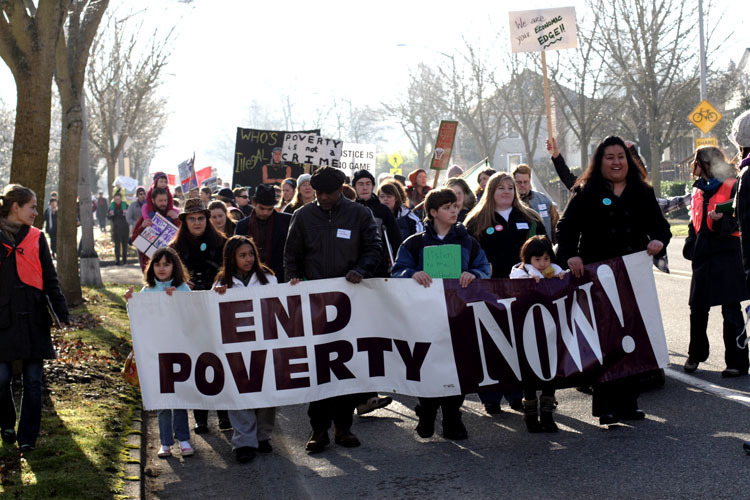 Almost 30% of children live in poverty. Thousands in our community live with hunger as a daily experience in the midst of wealth that would have made the pharaohs blush. Across North America, you do not have to go far to find today’s Sodoms. Which of these four is the type we would find in Sodom? One might be tempted to say that it is the fourth type—the wicked people who lay claim to everyone’s possessions. Curiously, though, the Mishnah says that it is the first type—the ordinary sort of people who neither share what is theirs nor claim what belongs to others. What is wrong with that kind of “ordinary” thinking? Our society did not become a place where real poverty and extreme wealth live side-by-side because of rapacious robber barons. Rather, we are a society shaped by the ordinary behaviors of people who believe they are entitled to keep what is theirs and “let everyone else do the same.” It is this attitude that is the recipe for Sodom. In such a society, the prevailing rule becomes “each man for himself” and the prevailing attitude toward the poor becomes “they have none to blame but themselves.” Such ordinary, common evil is what the rabbis so much wanted to warn us against. I cannot claim that Jewish tradition has specific policies to recommend to us for the creation of a more open-hearted and caring society. After all, there is no prescription in the Torah for the right tax code or the right welfare policy for our times. However, I can say that the rabbis have warned us against building a society on policies that focus more on property rights than on the obligation to care for each other. I ask you to think about the way that contemporary politics puts so much emphasis on keeping the hands of government off of the wealth of the wealthy, and so little emphasis on the immorality of allowing people to go hungry. When you do, consider that we have become the children of Sodom. A female, Jewish, lay chaplain at our local hospital? Who knew? I’d never given much thought to chaplains one way or the other. Fortunately I’ve spent very little time in hospitals — much less in prisons or the military — and the word chaplain conjured up images of a middle-aged Christian man, someone like Father Mulcahy in MASH. So I was intrigued when the editor of our temple bulletin approached me during high holiday services and asked if I’d like to interview a young woman in the congregation who is working as a chaplain at Alta Bates Summit Medical Center. Jennifer Mahru, 33, is one of only seven participants in an intensive, year-long, on-the-job chaplaincy training program at Alta Bates Summit. It turns out that Jewish chaplains are pretty common. But lay chaplains like Mahru — who are not ordained clergy — are very unusual. Mahru, inspired by her relationship with Temple Sinai‘s recently-retired Rabbi Steven Chester, had initially considered enrolling in rabbinical school. But she didn’t want to leave the Bay Area. And she realized that the parts of rabbinic work that spoke most deeply to her – pastoral work and counseling – could also be done as a hospital chaplain. “I wanted to be there for people when they most need it, when they are vulnerable or ethically challenged,” she said. Alta Bates chose Mahru from among 65 applicants for the training program, apparently on the strength of her experience as a hospice volunteer at the Jewish Home of San Francisco and her plans to go to graduate school in theology next year. Mahru works a 40-hour week, assigned to different hospital units, and is on call for 24 hours every week or two. She gets called in for any death in her unit, even if the family doesn’t specifically request a chaplain. As a trainee, she meets weekly with an experienced chaplain supervisor and takes part in lectures and case study discussions with her fellow trainees. Barely two months into her chaplaincy, Mahru already has enough stories to fill a book – patients who are furious or terrified about facing the end of life, others who simply want a friendly chat, nurses who need to grieve about a death on their ward. She ministers to people of all religions, whoever is in her assigned unit on a given day. With non-Jewish patients, Mahru introduces herself as “one of the chaplains” and doesn’t mention her Judaism unless asked. If patients want her to pray with them, she does so in language that doesn’t compromise her own beliefs. If patients ask for clergy from their own faith, she arranges for that. Most of the time, Mahru’s non-Jewish patients are delighted to have her there. One day may find her sitting with a bereaved Hindu family as they sing hymns in a language she didn’t understand. Another may find her accompanying a Catholic priest as he baptizes a baby in the neonatal intensive care unit. Sometimes, though, there are moments of friction. “Not unless you are praying to the real and true God,” the woman responded. Her reward is the opportunity to support people as they confront questions of mortality and vulnerability that are often shunted aside in daily life. The traditional Torah reading for Yom Kippur morning is a section from Leviticus that involves the details of ritual sacrifice at the Temple in Jerusalem. But the 19th century pioneers of Reform Judaism felt this was irrelevant to modern life and humanistic religion, and substituted a different passage — Nitzavim, or Deuteronomy 29:9-30:20. Nitzavim presents Moses’ farewell address to the Jewish people, as he readies them to enter the promised land without him. He reminds everyone gathered before him that they have entered into a covenant with God. He recounts the “detestable things” and “fetishes” they left behind in Egypt, and predicts that some of them will succumb to the temptations of idolatry, thinking “I shall be safe, though I follow my own willful heart.” He warns them that they will be punished and exiled — but if they repent and return to following the mitzvot, God will welcome them back and return them to prosperity. I suspect there’s some historical backstory here — that this section of the Torah was written at a time when the Jews were returning from exile in Babylon, and the author may have intended to explain the exile and exhort the people to better behavior. I haven’t done the research on this, so please jump in and correct or amplify if you know more. But historical analysis aside, it’s a fitting portion for Yom Kippur in its focus on the dangers of sin and the rewards of teshuvah (which translates as turning, or repentance). And the image of Moses speaking before the entire community of Israel — old and young, the portion tells us, men and women, officials and strangers, even the humble wood-hewers and water-drawers — is appropriate for the only day of the year when every single member of a Jewish congregation shows up for services. There are two parts of the portion that I find particularly moving. It feels almost like science fiction, some wormhole or rip in time that allows Moses to speak simultaneously to all Jews through the centuries. The covenant includes those not present because they have died, and those not present because they are not yet born. It gives me a shivery transcendent feeling — I’m part of this stream that extends back to Abraham and forward as long as there is a Judaism. My grandparents who have passed away are part of it. The great-great-great-grandparents whose names I don’t even know are part of it. My daughter’s unimaginable grandchildren are part of it. For a moment we are all here together, standing near Mt. Nebo listening to Moses. The other line I particularly like comes later in the portion, when Moses reassures the gathered populace that they can, in fact, fulfill their end of the covenant. Surely, this instruction which I enjoin upon you this day is not too baffling for you, nor is it beyond reach. It is not in the heavens, that you should say, “Who among us can go up to the heavens and get it for us and impart it to us, that we may observe it?” Neither is it beyond the sea, that you should say, “Who among us can cross to the other side of the sea and get it for us and impart it to us, that we may observe it?” No, the thing is very close to you, in your mouth and in your heart, to observe it. I find this a comforting way to think about other challenges, not just the challenge of leading a moral and righteous life. But in reality, a surprising number of the things that cause us despair are not beyond us. They are not in the heavens, they are not across the ocean. Sometimes we just need to calm ourselves down — take things step by step, piece by piece, or, in Anne Lamott’s phrase, bird by bird. It is not too baffling for us, it is not beyond reach. The answers are close to us, in our mouths and hearts. Yesterday I saw Between Two Worlds, a new documentary about dissent and division within the Jewish community, by the talented Berkeley filmmakers Deborah Kaufman and Alan Snitow. The screening was part of the 31st annual San Francisco Jewish Film Festival, and the festival itself was featured in the documentary — in particular, the brouhaha two years ago when the festival aired a film about the pro-Palestinian American activist Rachel Corrie, who was killed by an Israeli bulldozer while protesting the demolition of homes in Gaza. One of the things I liked the most was the way Deborah and Alan wove their own families’ stories into the mix. Deborah’s father was a refugee from Nazi Germany who became a a very active Zionist, only to have one of his daughters convert to Islam. Alan knew his mother as a suburban housewife and liberal activist with the American Jewish Congress — only to discover, after her death, that she had been a member of the U.S. Communist Party for over a decade as a young woman. Deborah and Alan’s narratives about these opposite-yet-parallel parents were nuanced, compassionate, and filled with unanswerable questions. Every time the film returned to them, I felt my shoulders relax and imagined my blood pressure dropping — a welcome change from the dire “us versus them” rhetoric that permeated the sections about politics and public debate. But none of that is what I want to write about. Is Judaism inherently a liberal religion? This is something that has crossed my mind a lot in the past year or so. Historically, American Jews have been overwhelmingly liberal — voting Democratic and supporting progressive causes such as civil rights, feminism, anti-war movements, and organized labor. But how much of this is inherent to Judaism as a religion and culture? And how much is due to the specific historical experience of American Jews over the past hundred or two hundred years? Okay. That’s the Judaism I know and love. BUT…. It’s also possible to interpret Torah in a way that looks nothing like Freedom Seders and marches against genocide. Consider the ultra-Orthodox — basing their entire lives around Judaism, but in a way that rarely touches on the concerns or needs of anyone outside their immediate, insular community. And Israel today… With the right wing holding the political reins, the country seems to be stepping down a road that veers increasingly away from democracy and civil liberties. The Knesset recently made it illegal to advocate boycotting goods from Israel or the Occupied Territories. Last year the Israeli Cabinet approved a law that, for the first time, required non-Jewish candidates for citizenship to swear a loyalty oath. Right-wing politicians have been trying to hold McCarthy-like hearings on groups involved in progressive issues such as civil rights, women’s rights, and religious pluralism. Maybe the liberal heart of Judaism that I’ve always taken for granted is a mere historical blip. Our grandparents and great-grandparents suffered pogroms; they toiled in garment sweatshops; they crossed borders legally and illegally in search of better lives. When those generations are a distant memory, will Jewish liberalism also become a memory? Note: Between Two Worlds will be showing at the Roxie Cinema in San Francisco from August 5th through the 11th. Alan Snitow and Deborah Kaufman will field questions after the Friday, Saturday and Sunday evening shows. Whether you end up agreeing with the filmmakers’ perspective or not, I promise it will give you something to talk about afterwards over a glass of ________ (wine, beer, coffee, tea, Slivovice, you fill in the blank). And for an interesting take on the rise of the right in Israel, see this piece by Liel Leibovitz in Tablet magazine.